a broad indemnity from the landlord in favor of the tenant relating to losses or damages arising from the landlord's construction activities. 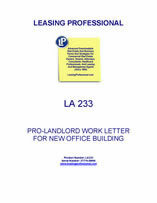 This pro-landlord work letter is designed for a lease of a new office building constructed by the landlord. The landlord is obligated to build the shell, and the tenant will construct his own tenant improvements. 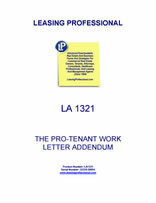 The work letter does not provide for a landlord construction allowance for the tenant improvements. The exhibit contains specifications for the landlord shell, and refers to shell plans which are to be attached to the exhibit when complete. 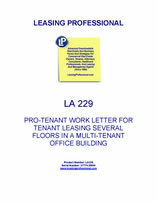 This pro-tenant work letter is designed for a large tenant taking multiple floors in a multi-tenant office building. The tenant has substantial approval rights over the plans, and rights to substitute materials to contain costs. 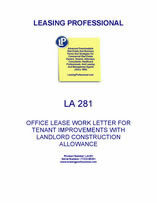 The work letter also provides for a construction allowance based upon the size of the premises, as well as a moving allowance for the tenant.